This page describes the steps to connect to a MySQL database. The particular example connects to PressWise so that data could be extracted for insertion into Control, but the general steps should work for any MySQL database. Note: Connecting to MySQL or other databases is not standard function of Cyrious and is not covered by standard support contracts. Assistance debugging or setting up this connection can be offered under the Supplemental Support Agreement. 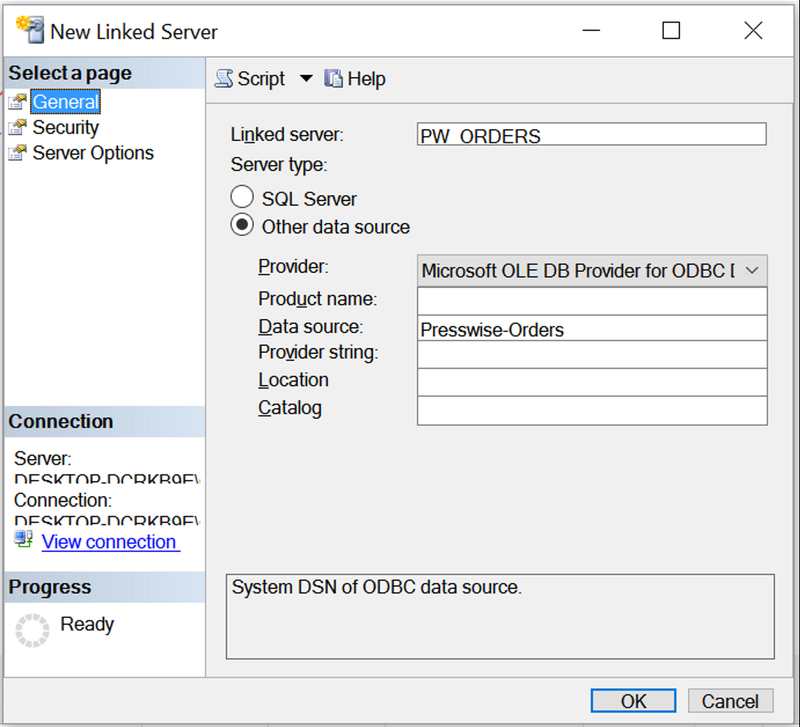 The JDBC driver must be installed on the MySQL server for ODBC connections to work. This process assumes this driver is already in place. If not, it should be installed by the IT team responsible for the MySQL database. If the output says (64 bit) in the name, it is 64 bit. Otherwise it is 32 bit. Install the ODBC Connector for MySQL. The version installed match the version (32 or 64 bit) of SQL you are using. There is no problem installing both the 32 and 64 bit, but the correct one must be used in the following steps. You must the ODBC configuration that matches the version (32 or 64 bit) of SQL you are using or you will get an “Architecture Mismatch” error when you try to use it. Click the windows button and type ODBC. Choose the setup corresponding the the version of SQL you are using (32 or 64 bit). Click on the System DSN tab. A User DSN will fail, since SQL is running as a different user. Test Connection. Click OK if successful. Correct values if not. 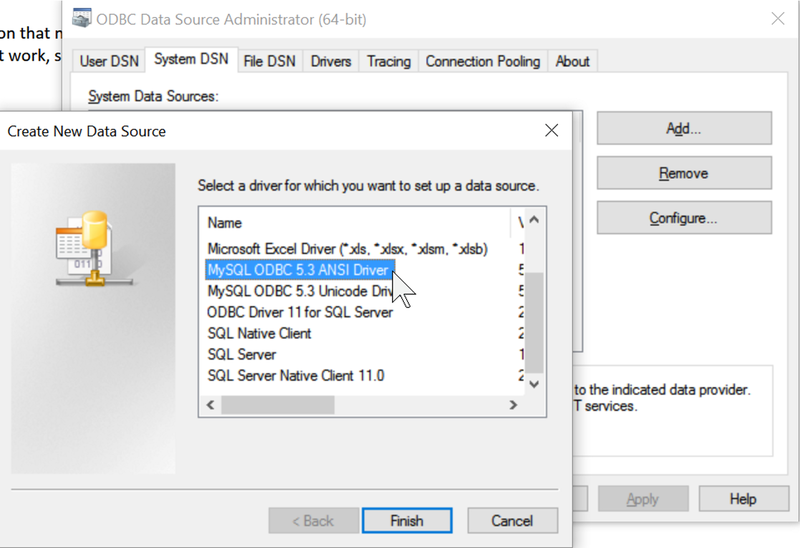 Open SQL Server Management Studio (SSMS) and connect to the SQL database engine with Control. Configure the MSDASQL provider with optios that MySQL supports. Click on the Security page. Select Be made using this security context to set up the default user and password. Open a new query windows in SSMS. Note: You can not choose a linked server as the default context, so all queries will need to use the four part table name has the format: server_name.[database_name].[schema_name].table_name. MySQL does not allow you to specify the database name and schema, so these must be specified in the DSN. Download the ODBC 5.1.13 (https://dev.mysql.com/downloads/connector/odbc/5.1.html). 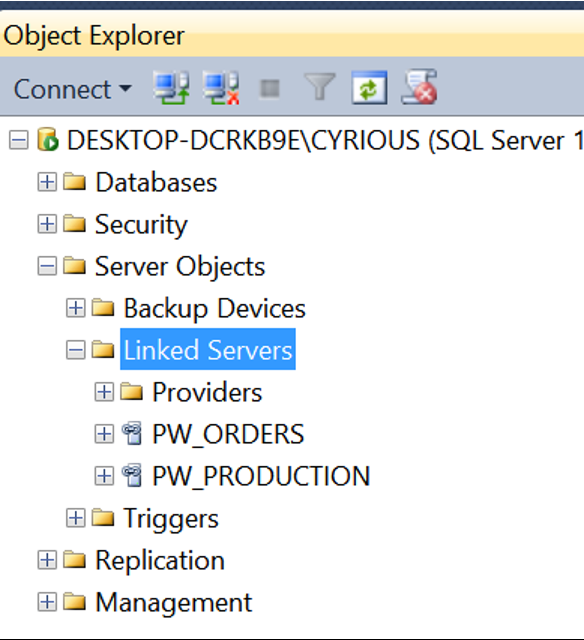 Set the Product Name EQUAL to the Data Source name on the General tab for you Linked Server Properties. 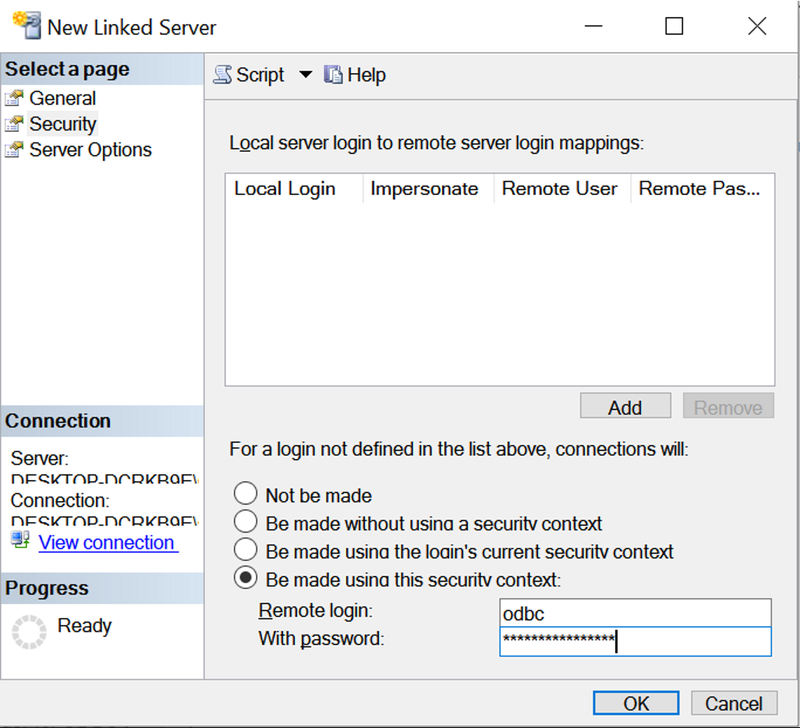 Set RPC and RPC Out to TRUE on the Server Options tab for your Linked Server Properties. Convert your enum data to char data.